The last three weeks have been a blur. A day after we received our engine and transmission, we had them both in the car. Everything went fairly smoothly and Jere Dotten, Gary Hunter and I spent a couple of days buttoning things up and working on systems. Weekend before last, Rennie Bryant came to the rescue and finished up the wiring that Jere and I had started. We then systematically went through the clutch, braking, cooling, electrical, and fuel systems before we ever tried to start the GT6+. We sprang a couple of minor leaks, but overall we had things ready for that initial startup. Finally, just a week and a day before Amelia Island, we were ready to fire up the Group 44 GT6+ up and see what we had. We made a video of this magical moment for those of you who wish to experience the sound that this race engine makes. The next day, after installing the driveshaft and working through a few more issues, we were able to drive the Group 44 GT6+. From there, we had just one week to sort, finish and detail the GT6+ for its Amelia Island debut. We installed the rest of the original seat belts along with some odds and ends we had lying around. We also had a tach cable flown in from England for the original Smiths chronametric tach. Thank you, thank you, Peter at Nisonger for helping us source this hard-to-get piece. We weren’t happy with the car's nose stripe, and with one day’s notice our friends at the Bodywerks repainted it. Then, friend and detailer extraordinaire Tim McNair came in a couple days early for his Amelia Island detailing assignment on the Meguiar's trophy-winning Delahaye. He helped us prep the GT6+ to within an inch of its life. Wow, we learned a lot about what it takes to detail a car for a show like Amelia Island. At 7:15 Sunday morning, we lit that baby up, shot out of the garage where we were storing it for the weekend, and roared down A1A with open pipes and no license plate. Tim McNair again went over the car, despite my taunting him that if you wax it more than twice your are playing with it. We went on to win a prestigious Amelia award for our efforts. From here, we will sort the car and get it ready to race. 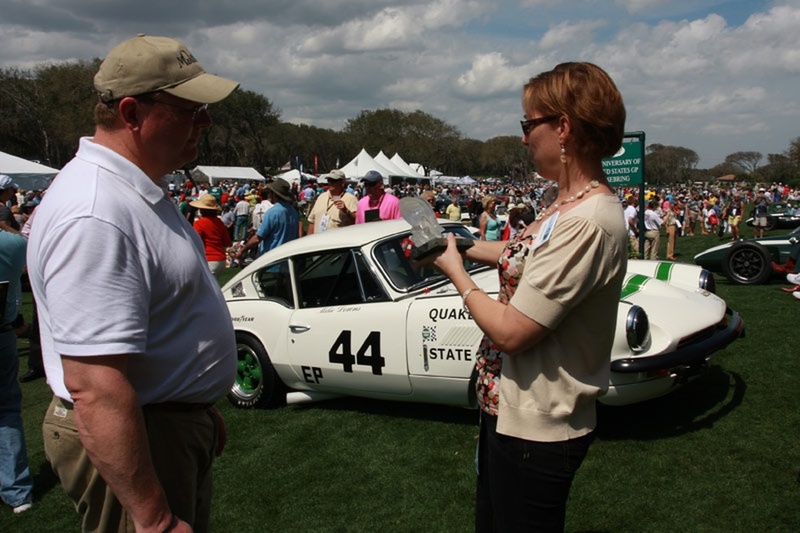 We also plan on bringing it to the Winter Park British car show April 4. Of course, we will have the car at The Mitty to join in on all the Group 44 Inc. festivities. Speaking of Group 44 Inc., Lanky Foushee, Bob Tullius, Hurley Haywood and the rest of the Group 44 Inc. team all complimented us on the work we had done. In fact, Tullius and Haywood were among the judges that bestowed the award on us. Congrats, job well done! Looks like it was a great time. Hope to maybe see the car one day at one of our Midwest Concours, possibly Ault Park, Keeneland, or Louisville. Magnificent work! it's been already years since i was there joining that event. Too bad i didn't won that contest mine just encountered an electrical problem and my lights wont go on because of the combination switch failure. wiring problem to be exact. I wish i also have a friend like Rennie Bryant. Cheers!